Godox is revolutionizing flash photography. 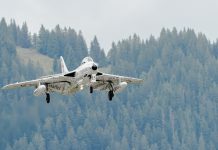 Their offering constitutes a systems based approach for through the lens (TTL), high speed sync (HSS) and remote manual mode flash photography with state of the art 2.4GHz wireless communication between transmitter on camera and remote flashes. This enables unrivaled flexibility in working on location and in the studio. This tutorial describes the Godox 2.4GHz wireless flash system. 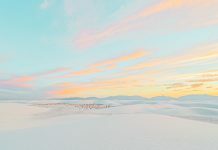 Although Godox offers this system for many different camera systems, the tutorial focuses on using it with Nikon cameras to simplify the description. However, the concepts apply to all supported camera systems equally. At the time of writing the Godox 2.4GHz wireless flash system is available for Nikon, Canon and Sony (Figure 1-1). Godox strives to expand it to even more camera systems. 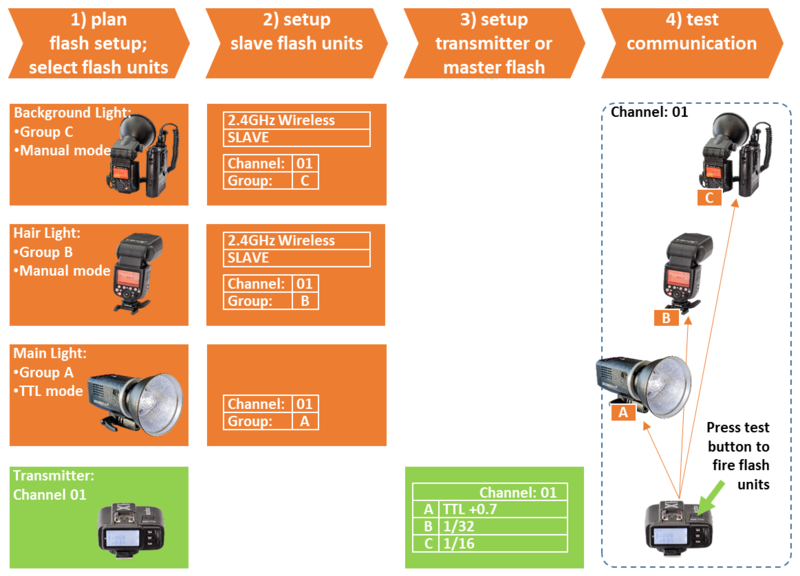 In principle, a wireless flash system consists of two parts: One unit mounted on camera that controls remote flashes, called transmitter or master flash and many flash units called slave flashes. The transmitter or master flash mounted on the camera serves two purposes: first to set up the remote flash units, selecting flash mode & flash power and second to trigger the remote slave flashes. Transmitter: The offering consists of transmitters or master flashes (flash with integrated transmitter) to control the slave flashes. Some Godox flashes can be used as either master flash on camera or remote slave flash. Slave flashes: The offering consists of a whole range of wireless flash units including speed lights, portable flash units and studio flash units. It is also possible to control Nikon speedlights through the Godox X1R-N receiver. Godox Transmitter X1T-N: The transmitter mounted on camera allows to set flash power & mode of the slave flashes and triggers the slave flashes through wireless communication. Godox Speedlight TT685-N and v860ii-N: The speed light mounted on camera in master flash mode allows to set flash mode and flash power of the slave flashes and triggers the slave flashes through wireless communication. Godox WITSTRO AD360iiN: The portable flash mounted on camera (or connected through a i-TTL cable to camera) in master flash mode allows to set flash mode and flash power of the slave flashes and triggers the slave flashes through wireless communication. In studio settings the preferred way to control and trigger the slave flashes is by using the transmitter X1T-N as it adds only little weight to the camera. However, in event photography a speedlight, TT685-N or V860ii-N on camera is in most situations extremely valuable. The possibility to control and trigger the slave flashes from the on camera flash through wireless communication adds incredible flexibility. In some situation, the flash on camera is all that is needed. In other situations where remote flashes are added they can be set up from the speedlight mounted on camera; there is no need to change to a trigger unit. 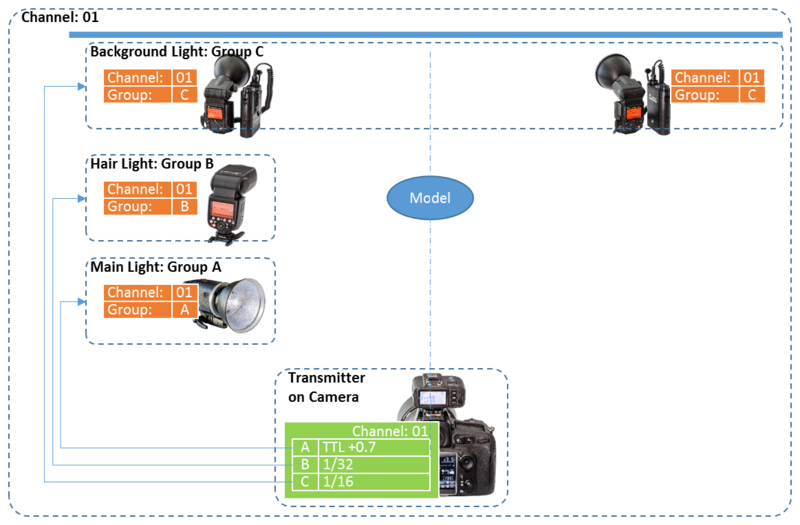 Channels: Channels are used to assign flashes to one specific lighting setup used by a photographer. Different channels separate control of flash units between photographers in proximity. Each photographer uses a different channel setting to not interfere with one another in the same proximity. Therefore, the channel setting is set to the same specific number on all flashes and on the transmitter or the master flash. Groups: Groups are used to assign flashes to a set of flashes that can be controlled independently of each other within a channel. Any flash unit assigned the same channel number as set on the transmitter or master flash will receive the trigger signal to fire the flash when a picture is taken. All flashes within the channel will fire, except if the group was set to disabled (off) mode. Short setup time is crucial in any shooting. Therefore, usability of the slave flashes, master flashes and transmitters are of high importance. Godox designed the user interfaces very concise and well aligned across the product family. The key functions are easily accessible. Nikon speedlights can easily be integrated into the Godox 2.4GHz system. This is accomplished by connecting a Nikon speedlight to a Godox X1R-N receiver. This enables the transmitter or the master flash to control the Nikon speedlight through the receiver. The added receiver integrates the Nikon speedlight fully into the Godox 2.4GHz system supporting remote manual, through the lens (TTL), and high speed sync (HSS) flash mode. Nikon speedlights with the attached X1R-N receiver can be used together with any Godox 2.4GHz wireless flash unit. The Godox WITSTRO AD360ii and WITSTRO AD600 portable flashes offer great flexibility when shooting with Nikon, Canon or Sony camera system on the same set. 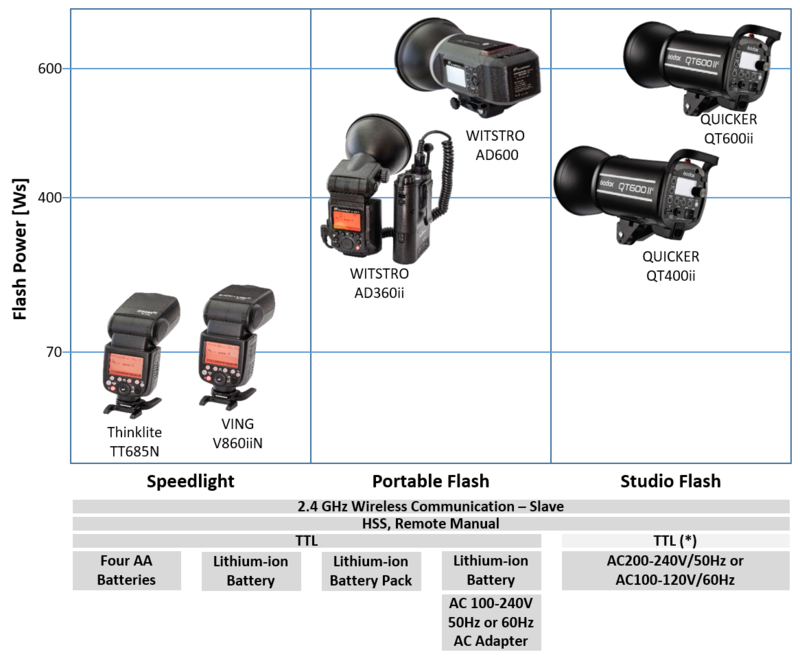 These flash units can be controlled from a Nikon X1T-N, a X1T-C and a X1T-S without changing any settings. Imagine you are taking pictures with a Nikon camera with attached Godox X1T-N transceiver controlling two remote Godox WITSTRO AD600 flashes. A second photographer one the set has a Canon camera with a X1T-C transceiver mounted on the camera. Without changing anything on the slave flashes he or she can control the flashes and take pictures with the Canon camera. All flash modes including TTL are supported. The AD360ii and AD600 flash units interoperate with X1T-N, X1T-C, or X1T-S transmitter mounted on a respective Nikon, Canon or Sony camera’s hot shoe. 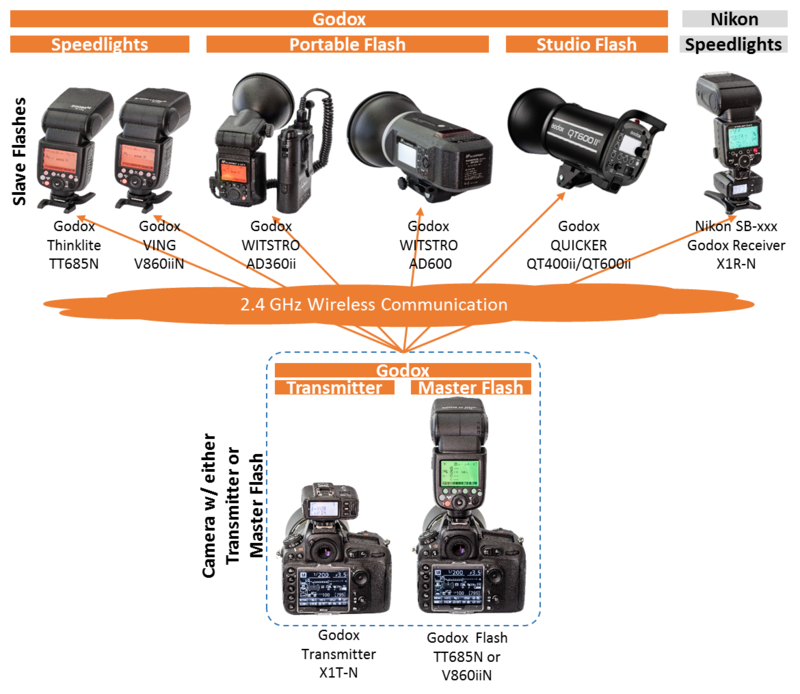 This means a photographer, or photographers, using Nikon, Canon and Sony cameras can effectively share the same set of flash units on the set without changing any setting on the flash units. Of course, Godox 2.4GHz TTL enabled master hot shoe flashes can be used in the same way as the transmitter unit on camera to control the slave flash units. Godox studio and portable monolights come with a Bowens mount connector. Light modifiers attach directly to the monolight. Godox portable flash units AD360ii and Godox speedlights TT685, V860ii and other Godox speedlights do not directly have the capability to be attached to light modifiers. However, they can be attached to light modifiers indirectly through a Godox S bracket. The Godox S Bracket provides a nice mount for the speedlights and portable flash units to a light stand and includes a very well-engineered tilt function. Nikon speedlights do not directly have the capability to be attached to light modifiers. However, they can also be attached to light modifiers indirectly through a Godox S bracket. Light modifiers with Bowens mount are ubiquitous and there are modifiers for almost all lighting circumstances available. In case you do already own light modifiers with another mount, you might be able to convert them to Bowens mount by replacing the speedring with a Bowens type speedring. Godox flash brackets add extreme flexibility in adding light modifiers to portable flash units and to speedlights. It allows for light modifiers with Bowens speedring, for umbrellas with shaft, and for light modifiers that directly snap on the 150mm front disk of bracket. Although the Bowens mount is the preferred option because it is the same mount as on the monolights and studio lights, the other options just increase the flexibility. Camera Support: As far as I know, Godox is working on extending the 2.4GHz wireless system to Fuji camera system. The Godox 2.4GHz wireless flash system is sold by Adorama in the US, rebranded under the brand name Flashpoint R2 TTL wireless. At the time of writing the flash units are essentially the same, only differentiated by naming. The following table translates between Godox and Adorama naming. If you plan on buying Godox flashes, I recommend the following stores. All these stores offers stellar service, both before and after sales. 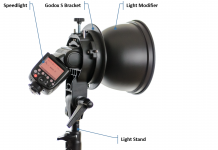 Adorama – Adorama sells the Godox flashes rebranded under the FlashPoint brand (USA). Fotichästli – Fotichästli sells original Godox flashes (Switzerland). Goodboy Studio Photography Equipment – Goodboy Studio sells original Godox flashes (Hong Kong). UCOLOR – UCOLOR sells original Godox flashes (China). I do own the following Godox equipment which I purchased from Adorama (USA), Fotichästli (Switzerland) and sellers in China and Hong Kong. I use them together with Nikon cameras. I do not have any relationship with Godox. Just for reference: I use the Godox Nikon System. Hello Ted Lansing, thank you for your article about godox. Of course I use godox lighting system. trusted seller, with after-sales service very excellent. Any support for Godox products in Switzerland? Hi Ted Lansing, thank you for your time and efforts! Very informative! Any support for Godox products in Malaysia? Can I use an X1T-S to trigger a X1R-N? I have an extra Nikon SB600 I would like to trigger via my Sony a6300 with a Godox X1T-S on it (and I have a TT685s). Do you know if I can use my TT685C (canon) as a off camera slave for a X1R-N nikon master (similar to how an AD600 would operate)? I have 2 Wistro AD600’s and an X1N transmitter mounted on Nikon D750. They work fine in manual mode but will not trigger when the transmitter is set for TTL. Any ideas why? Do you have the TTL versions, there’s are manual and TTL version of the AD600. Very thorough and useful article. Thank you. Tell me, if someone is using two QT400ii for example, it would be easy to get a specific x-fstop difference between key and fill lights by using TTL + .7 on one and TTL – .3 on the other, right? In my previous comment, I meant to get a 1-stop difference, you would dial any combination between the two flashes that add up to 1 (such as +.7 and -.3). But that does not work. Could it be that the two flashes interfere when light gets measured? Only one flash can be set to TTL then? BTW, is the a TTL setting on those flashes or are they just “following” the X1T trigger? I wonder if two transmitters can control the same flashes? I shoot events with two cameras. Yes, two transmitters can control the same flashes. I use two Nikon cameras on the set, both with an X1T-N transmitter mounted to control the same flashes. When changing cameras, press the test button on the transmitter of the camera you are switching to. This sets the slave flashes to the mode and power set on the transmitter in use. How to set up godox transmitter mounted on the camera nikon with a flash on top of it.aswell as the received being set up with another flash. All nikon. My flash does not fire from the transmitter which is mounted from the camera. Please help. Hi Robby, Yes aou can use multiple cameras with each having an x1 transmitter to control one flash. I use this configuration sometimes with two cameras such that I do not have to switch lenses. The settings from the transmitter of the camera that you are using are sent to the flash. I typically press the test button on the x1 transmitter on the camera I pick up. This ensures that the settings are transmitted. Hope this helps. I’ve heard rumours, that when the X1N receiver is used with the SB910, I need to set the speedlite to TTL, and that while I can adjust the power through the transmitter, and it will fire at the selected power, the actual setting, will not be seen on the LED screen for the 910. Do you know, if this is correct? Any help here, will be gratefully received. Thanks! What type of transmitter do I need with the WITSTRO AD200? The Godox Witstro 200 has the Godox 2.4GHz X Radio System built in. You can trigger it with the Godox X1 transmitter mounted on the camera. Select the appropriate transmitter for your camera system, e.g. for Canon, Nikon, or Sony. Thanks for the informative piece. Your article convinced me to invest in a Godox system for studio and sports work. My equipment: Godox V860II-N Speedlite; X1T Transmitter; Nikon D500. I want to disable what appears to be a pre-flash when using the the V860 in wireless i-ttl mode. The D500 modeling flash menu>e5 is disabled. The issue is not present when the V860 is mounted on the camera. Excellent and very much useful ! Ive Nikon SB500 & SB 800. Can i control both the flashes with Godox X1T on my Nikon D850 ? or should i buy two receivers of Godox X1R. This is the best resource fo Godox anywhere. The transmitter has a hot shoe. Can a second transmitter be used to fire a remote SB800? I have a few of them! When no using 2 bodies, I would like to use the second transmitter as a receiver. Hi Ted, good review and read all. Thank you very much. I could not be sure that If I want to use 1 pcs of Godox Monolight Wistro AD600B and 1 pcs of TT685N or V860IIN together which are integrated 2.4 GHZ radio receiver, Can I trigger them with only 1pcs of X1 trigger If I adjust them both same group and channel? Could you please answer if you do some test or if you have experience about this issue? Thanks in advance & Have a nice day. Thank you very much for your comments. I do appreciate it. a) On the transmitter on the camera I dialed in TTL mode for Group A. All other groups are off. Both flash units are set to TTL mode and are controlled to get a proper exposed picture. b) On the transmitter on the camera I dialed in M Mode with 1/16 power for Group A. All other groups are off. Both flash units are set to manual mode with 1/16 power. Do you have expirimented wit stroboscopic or multi flash with TT685N flashes and the X1 trigger? I have been asked to do some shooting in a karate school and i like to shoot wit multi flash while the karateka is flying tru the air in a high kick. the menu is not quite clear to me and i wander if you give me some tips. Thank you very much. Unfortunately I do not have any experience in multi flash or stroboscopic use of the Godox or any other flash equipment. This is a function that I have not used at all in my photography. A photographer that I admire and that is also using the Godox system is Mark Kitaoka. He is in dance photography and might have used the flashes the way you are investigating. I would write to him. See: http://www.markkitaoka.com/latest-news/using-the-godox-system/. His email is: mark@markkitaoka.com. I hope this helps. Thank you for sharing this info! Very thorough explanations that are extremely helpful. I use Nikon bodies and have Nikon Speedlights and planning to go with the Flashpoint XPLOR 600 Pro. I am happy to see a solution where I can still trigger my Nikon Speedlights. This is a wonderful compilation/summary of Godox system. Very helpful for someone who is new to the system. I am picking up information left and right in little pieces to learn about Godox. Because you have all the gear, and I don’t, may I ask you a question? I happen to have a Nikon DSLR, and a pile of SB-800s. What I want to do is attach a Godox Transmitter X1T-N to my D800E. And also one Godox Receiver X1R-N per each of the four SB-800. And what I want to do is turn on Auto FP/HSS on my D800E, so that it can go all the way up to 1/8000th of a second. And then with the X1T-N commander I want to dial in a manual setting for each SB-800. So I guess my question is, can I have both Full Manual + HSS/Auto FP? Thank you!! Keep up the great research! I am looking to buy Flashpoint zoom R2 (https://www.ebay.ca/itm/Flashpoint-Zoom-TTL-R2-Flash-With-Integrated-R2-Radio-Transceiver-for-Sony/372392530764?hash=item56b453134c:g:0yAAAOSwmcZbZ6uS) which is basically same as Godox tt685 according to this. So would this Flashoint zoom R2 will work with other Godox flashes (like tt350) as a master or Slave ?